MyFileConvert Toolbar is the PUP that uses misleading techniques to prevent removal. Use Reimage to locate malicious components and get rid of them faster than with uninstall instructions. A full system scan blocks virus reappearance and prevents traffic to malicious domains. MyFileConvert Toolbar created by Mindspark Interactive is a browser extension that allows converting files to PDF or MS Word formats. Nevertheless, this tool is legitimate and might look useful; security specialists suggest staying away from it for several reasons. It might get inside the system silently in a software bundle, alter browser’s settings, replace default homepage, search engine, and new tab URL address, and track information about users. Due to these negative features, this toolbar is known as a potentially unwanted program (PUP) and a browser hijacker. 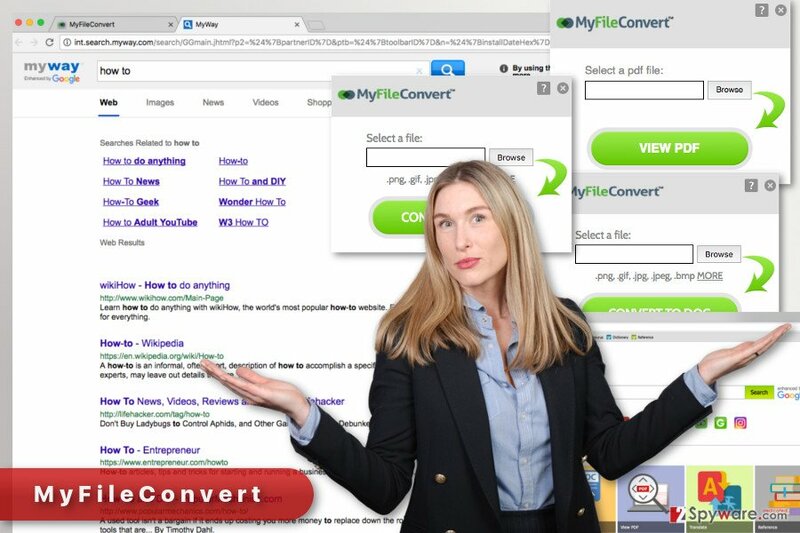 It doesn’t matter whether you install MyFileConvert directly from the official site, or install it unintentionally when installing freeware or shareware, you agree to replace your current search engine to hp.myway.com. The search engine includes quick access to social media websites, online dictionaries, and allows converting files directly from the homepage. Indeed, this feature might look useful if you need to convert files on a daily basis. However, the price of this utility includes an inability to access a reliable search engine from the start page, risking to visit a potentially dangerous website or clicking on a malicious ad. Thus, you should remove MyFileConvert from the device immediately. Besides, if this toolbar was installed without your permission, you should also scan the computer with Reimage and make sure that any other PUPs haven’t been installed without your knowledge as well. So-called MyFileConvert virus is not a dangerous program itself. Actually, it’s more an annoying application than a hazardous threat. However, having this toolbar installed on the computer, increases chances to encounter threatening cyber infections. The browser hijacker might be capable of displaying third-party ads on each visited website and including sponsored links into search results page. Thus, if you click on such commercial content, you might be redirected to potentially dangerous websites where you can get infected with malware or tricked to reveal personal information. Nevertheless, this search engine is marked as “enhanced by Google” it’s not worth relying on. This reference only means that this search tool uses Google database; however, developers might alter them if it is necessary. Necessity might occur if some business enterprises decide to promote their products or drive traffic using the help of a potentially unwanted program. While users are visiting third-party sites, authors of the program generate revenue. So, if you are not excited about an idea that someone might be using you as a money-making tool, you should not delay MyFileConvert removal. After the installation of MyFileConvert Toolbar, your browser's homepage, search engine, and new tab address are replaced with another domain. MyFileConvert Toolbar has an official website with a download link. As you already know, it might be also promoted in software bundles and infiltrate the system unnoticed. This and many other PUPs are distributed employing the same old bundling technique which allows adding the app as an optional component. If users rely on Quick or Recommended installation mode when installing new programs from the Internet, they do not know what other programs they agree to install. These installation wizards do not openly disclose about third-party software attached to them. Thus, in order to avoid MyFileConvert hijack and other undesired applications, you need to opt for Advanced/Custom settings. By following each installation step carefully, you will be allowed to see the list with additional downloads and reject their installation. If you installed this app yourself, it should be enough to remove MyFileConvert just like any other extension from Internet Explorer, Mozilla Firefox, Google Chrome or Safari. However, we also recommend resetting your browser in order to delete tracking cookies and protect your actions online from spies. However, if this app was installed packed with other software, you should look up for other programs and extensions that might be installed on the device. In this case, you can follow our prepared instructions below or opt for the easier MyFileConvert removal option. You can get rid of this potentially unwanted program by scanning the computer with an updated anti-malware software. By following the instructions below, you should look up for MyFileConvert and other unknown programs installed on your PC without your knowledge. We recommend searching for programs developed by Mindspark. 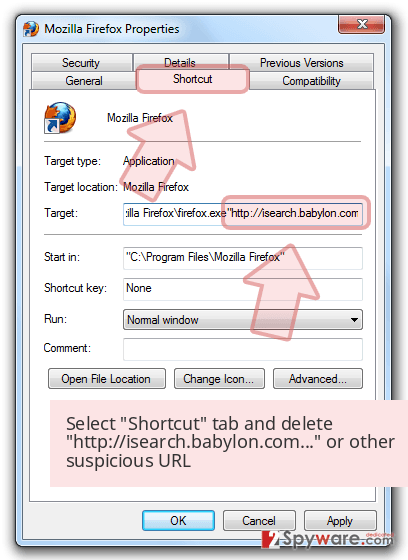 Here, look for MyFileConvert Toolbar or any other recently installed suspicious programs. 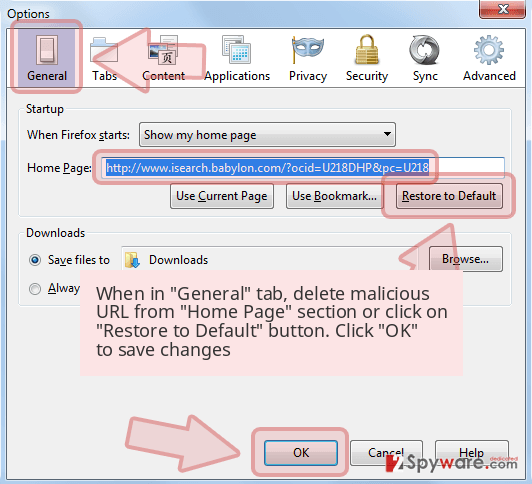 Below you will find instructions that will help to uninstall this suspicious toolbar. Wait until you see Applications folder and look for MyFileConvert Toolbar or any other suspicious programs on it. Now right click on every of such entries and select Move to Trash. Make sure you delete all unknown add-ons from Internet Explorer. 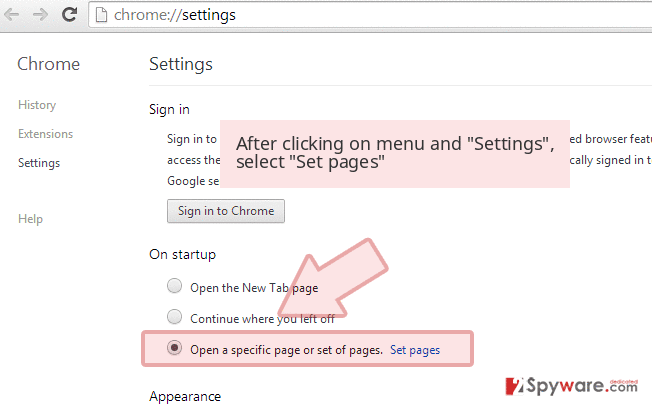 Then reset the browser as shown below. When in the new window, check Delete personal settings and select Reset again to complete MyFileConvert Toolbar removal. 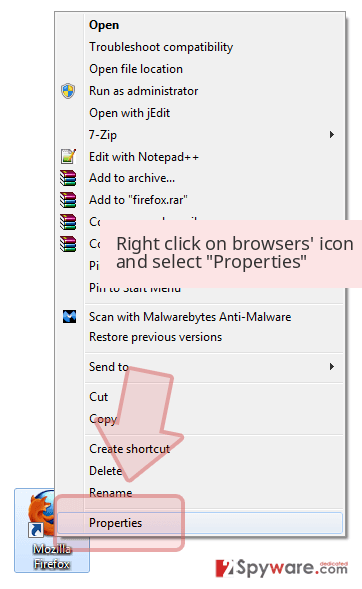 Once these steps are finished, MyFileConvert Toolbar should be removed from your Microsoft Edge browser. Open the list of Mozilla extensions and look for MyFileConvert Toolbar. Uninstall it, as well as other unknown entries that might have been installed as well. Then, follow the instructions to reset the browser. It helps to delete tracking cookies and other components. Here, select MyFileConvert Toolbar and other questionable plugins. Click Remove to delete these entries. Now you will see Reset Firefox to its default state message with Reset Firefox button. Click this button for several times and complete MyFileConvert Toolbar removal. 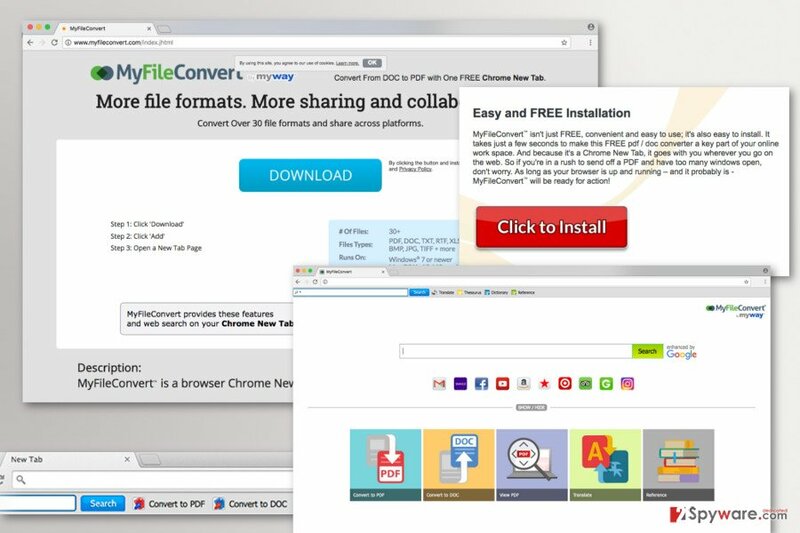 MyFileConvert browser hijacker might be installed in Google Chrome as a browser extension. Thus, you need to go to the list of extensions and uninstall it. Also, we recommend looking for other third-party toolbars, extensions or plugins that you do not remember installing yourself. If you find them, uninstall them as well. Here, select MyFileConvert Toolbar and other malicious plugins and select trash icon to delete these entries. Click Reset to confirm this action and complete MyFileConvert Toolbar removal. 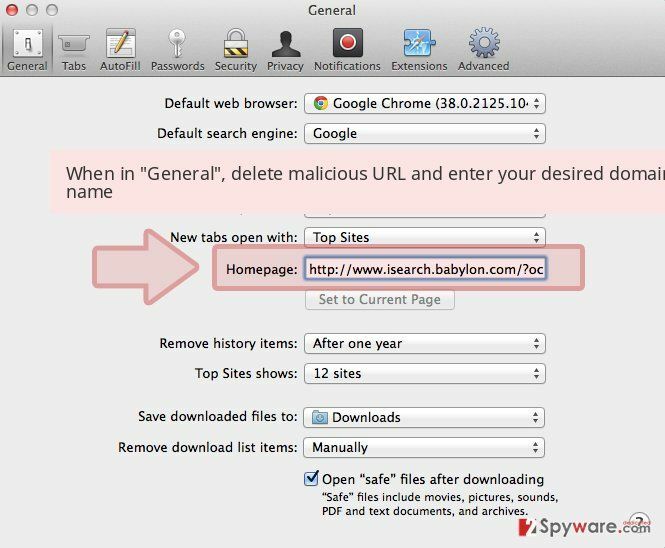 From the list of Safari extensions delete MyFileConvert and other suspicious entries developed by Mindspark. Once all unknown entries are deleted, reset the browser. Here, select Extensions and look for MyFileConvert Toolbar or other suspicious entries. Click on the Uninstall button to get rid each of them. Here, look at the Homepage field. If it was altered by MyFileConvert Toolbar, remove unwanted link and enter the one that you want to use for your searches. Remember to include the "http://" before typing in the address of the page. Now you will see a detailed dialog window filled with reset options. All of those options are usually checked, but you can specify which of them you want to reset. Click the Reset button to complete MyFileConvert Toolbar removal process. ^ Stefan Heule, Devon Rifkin, Alejandro Russo, Deian Stefan. The Most Dangerous Code in the Browser. Standford University. Stanford Secure Computer Systems group website. ^ Dan Kaplan. 8 Reasons Why the Malicious Ad Threat Is Poised to Grow Even Worse. Trustwave Blog. The company blog about online security. ^ Arpita Ghosh, Hamid Nazerzadeh, Mukund Sundararajan. Computing Optimal Bundles for Sponsored Search. University of Southern California. USC Research Computing Facility. ^ Kaveh Waddell. Your Browsing History Alone Can Give Away Your Identity. The Atlantic. The website covers news and analysis on politics, business, culture, technology, national, international and life . ^ Judy Engel. How to avoid installing junk programs when downloading free software. RASCAL. The website of Rogue Area Senior Computer Assistance League. This entry was posted on 2017-05-03 at 06:10 and is filed under Stealing programs, Viruses. You can quickly scan the QR code with your mobile device and have MyFileConvert Toolbar manual removal instructions right in your pocket. How did you remove MyFileConvert Toolbar?